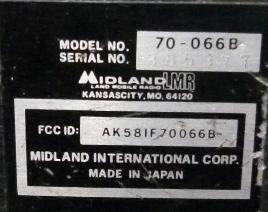 The Midland 70 series mobile transceivers were made from the early eighties to the mid nineties. There are three types, Syntech I (ST-1), XTR and Syntech II (ST-2). As far as I know they were made by Mitsubishi. 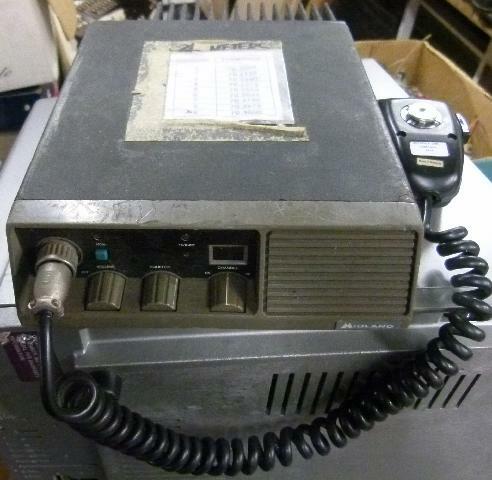 The 70-066B is a Syntech I, 75 - 88 MHz, 40 Watt, 80 channel model. Mine is programmed for the simplex FM channels. Channel programming is via a 2716 EPROM, which needs to be removed and re-programmed to change things. Of course one needs a special programmer (which I don't have). Note: About halfway through this process I learned that the Midland LMR Yahoo group has an executable that creates the EPROM image for you. You still have to desolder the EPROM to program it in a conventional programmer, but that's trivial. However, reverse engineering is still fun. 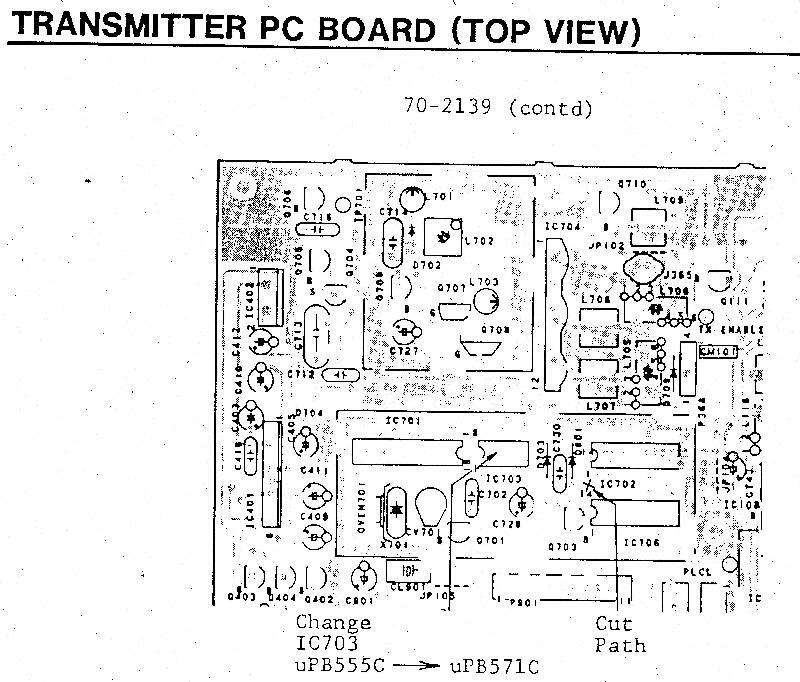 The PLL is IC701, labelled what looks like uPD 2833C-003 in the schematic but MPD3805C-003 in the parts list. Programming is via pins 1, 7 and 6 (data, clock, load) which go all the way across the page to the HD44840 microprocessor and the 4021 shift register. The PLL works in conjunction with a dual-modulus prescaler, in this case a uPB555C which is almost, but not quite entirely unlike an LM555. Had me fooled for a while. Anyway, the uPB555C divides by 32/33 since M1 and M2 (pins 8 and 7) are connected to ground. 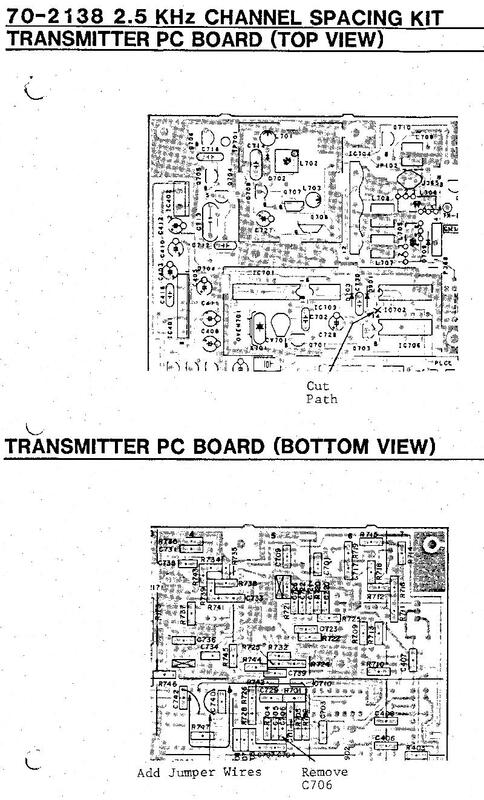 If you're not familiar with dual-modulus PLL, maybe the last page of the MC145158 datasheet is a good place to start. NT = NP+A, where P = 32, A is the 7 bits going to the swallow counter and N is the 10 bits going to the main counter. The 5.12 MHz clock is divided by 1024 to provide a 5 kHz reference. At a operating frequency of say 70.2 MHz, the receive VCO frequency will be +21.4 = 91.6 MHz and the transmit VCO frequency will be +20.48 = 90.68 MHz. This gives NT = 18320 and 18132 respectively. however does. 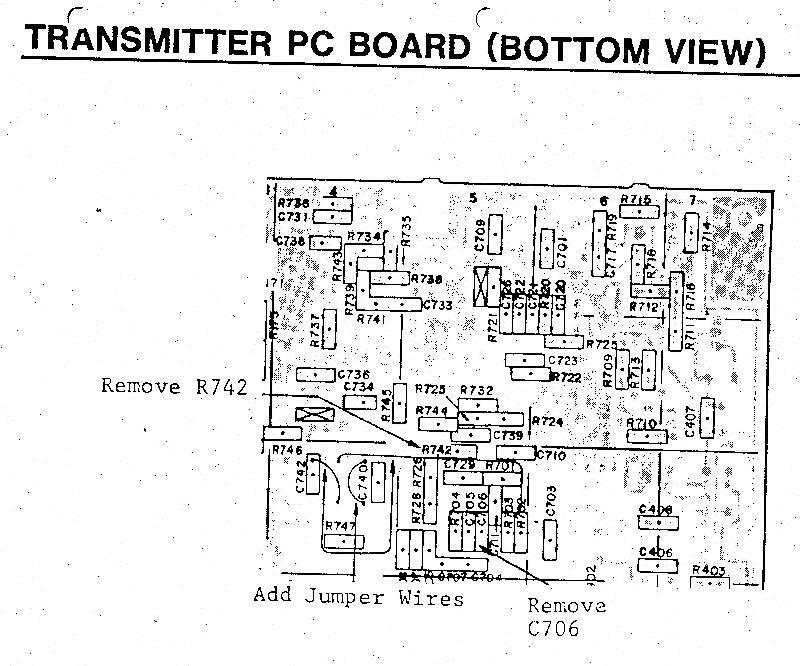 Looks as if the processor starts shifting from byte zero for the channel, reading the bit in via D1, and the first 15 bits get clocked through the PLL shift register and fall out the other side, after 32 clocks the last 17 bits are in the PLL shift register and then it gets loaded into the data register. All the calculating was wearing me down, so I wrote some code. These values all appear in my binary so I must be on to something. 00000420  FF 01 1B 8A FF 01 1B 8C-FF FF FF FF FF FF FF FF  ................  "41"
But as I said, this is just for interest, get the MPR70 executable from the Midland LMR Yahoo group (run it in DOSBox). In South Africa we started off with 25 kHz channel spacing with the option of moving to 12.5 kHz channel spacing when the bands get congested. The 70 MHz band is shared with other users who tend to use 25 kHz spacing, which means that we can use the "in-between" channels without interfering with one another. This is evidenced by the channels programmed into my radio, except that the radio physically only offers 5 kHz spacing so the channels of interest are all off by 2.5 kHz. Midland calls them "splinter" frequencies. 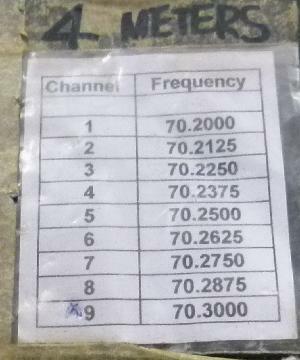 It doesn't really matter whether the channel spacing is 12.5 kHz or 2.5 kHz, either will give me what I need. The Service Manual is wrong. The manual for the 70-1000 programmer corrects this. 80, 8B and 8D are high side injection, 8A, 8C and 8E are low side injection. I fired up the software and created an EPROM image with the first channel at 70.200 MHz receive and transmit. Did this for all six codes, and dumped the EPROM images. Note that the 8D Rx value is 0x11E20 = %0001000111100 01 00000. The "filler" bits are not zero, which tells me the swallow counter value is not five bits but six, i.e. the dual modulus prescaler is a 64/65 counter and not a 32/33 counter. Some googling tells me the uPB571C (pin compatible to the uPB555C) will do the job. 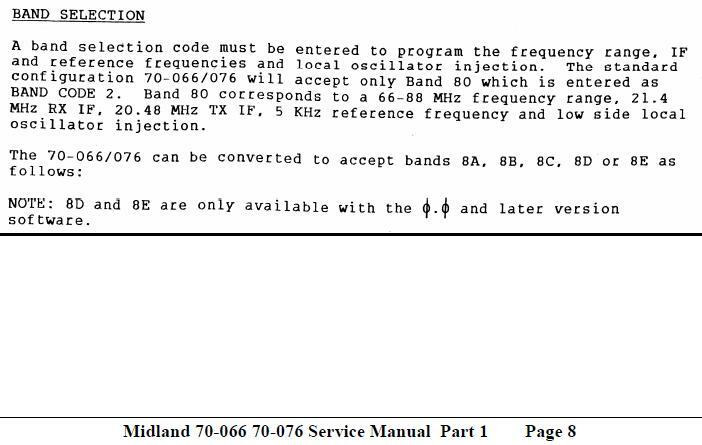 Since my goal is to get the splinter frequencies, I can ignore the low side injection option, leaving me with the choice of 8B (which implies changing the transmit VCO frequency to 19.2 MHz) and 8D (which uses a different swallow counter). Since the uPB571C is easily found on eBay, 8D would be my preferred route. 8D is also easier because with the transmit VCO not changing, only one reference frequency needs to change. The 5 kHz reference needs to be divided by two to give a 2.5 kHz reference for the PLL. It looks as if the spare flip-flop in IC702 (74LS93) might do the job, but I am worried about the control line from the processor D15 to IC702 pins 2 and 3. The divider might be disabled during receive. Update: I got hold of the 70-2138 (2.5 kHz steps, low side injection) and 70-2139 (2.5 kHz steps, high side injection) instructions. The hardware required consists of 150mm 28AWG wire (70-2138) and 150mm jumper wire + a uPB571C prescaler (70-2139). This confirms that my analysis is correct. Go me. 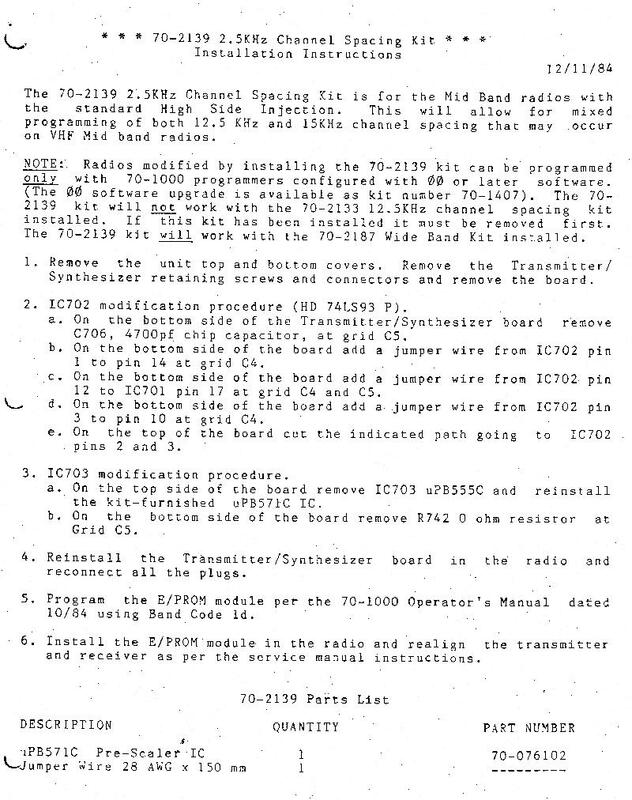 The instructions also call for grounding ping 2 and 3 of IC701 and cutting the trace to the micro, so my guess that the divider is only enabled during transmit is correct, but obviously running it all the time doesn't make a difference. 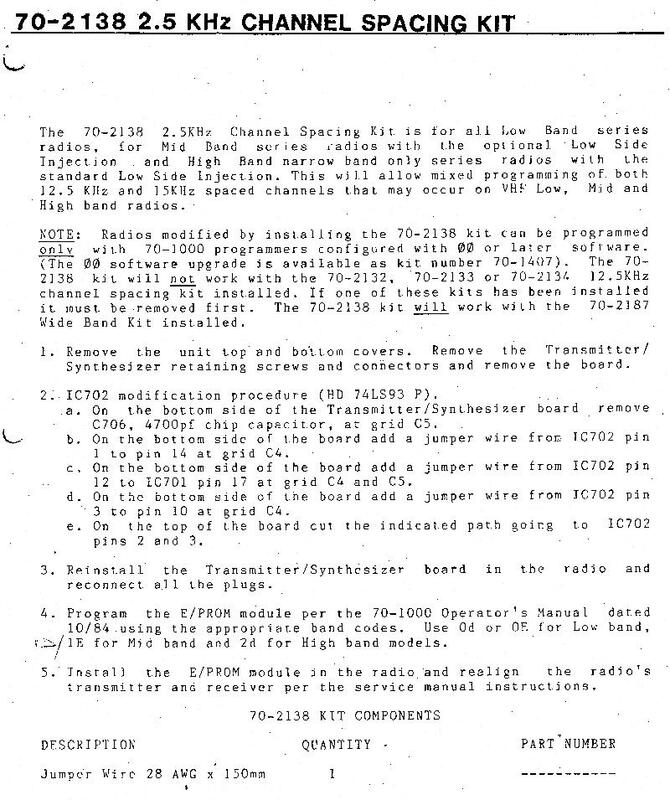 Of course, for true 12.5 kHz channel spacing I'd also need to install 70-2135, which consists of a replacement 21.4 MHz crystal filter and two replacement 455 kHz ceramic filters. But I'm not really worried about that, as I said we use the "12.5 kHz" channels mostly and there's no real traffic on the "25 kHz" channels. Still no idea how modes 8B/8C work. V51PJ uses FM, fsk441 and DK7ZB antennas.